I am now in “expressing myself with oil painting” mode and have been for about the past month. I had previously been using watercolours, however I needed a break from them as I was feeling rather saturated with the medium. Now I feel as though I’m back in the world of oils and all that goes with it. I am not as experienced with oil painting as I am with watercolour. Watercolour comes more easily to me due to more years of practice and I tend to see oils as more of a challenge. It’s as though I can really sink my teeth into them as they allow me to express myself artistically in a different way – with more push and pull. They feel more hands on and expressive. Another interesting thing is that I tend to use my subject matter in a way that I wouldn’t ordinarily use it. I go for something that is a bit more than “representational” and crosses over into what I would call a more “magical realm”. Yes, you can tell that the tree is a tree, yet its shape and form don’t conform to the everyday appearance of a tree. The tree instead has a more animated quality to it, that of seeming more alive and flowing. Looking at the painting “Hamptons Trees” below I hope you can see what I’m talking about. 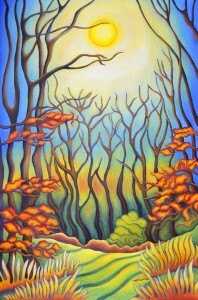 The branches and trunks of the trees curve and vibrate with light. The colours are more vivid and it’s as though you can feel their essence. I am very excited about my oil painting right now. Sometimes there is the chance that the paintings might not even work out as planned and that’s okay. I do however believe the expression is there and that really counts for me.